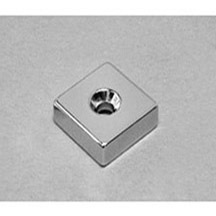 The SMBN0486 BLOCK neodymium magnet is made from high performance N42 NdFeB, with Nickel coating. 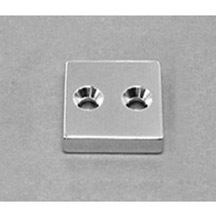 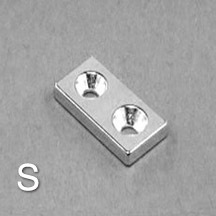 The dimension of this item is 3/4″ × 3/4″ × 1/4″ thick w/ countersunk hole to accept #6 screw, magnetized Through Thickness, with tolerance of ±0.004″ × ±0.004″ × ±0.004″. 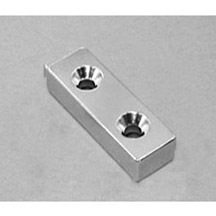 The weight of this super strong neodymium magnet is 0.03575 lbs. 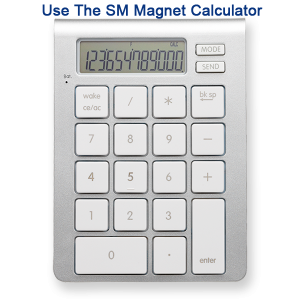 It can pull up to 19.26 lbs steel.